Oliver Plunkett was born in Loughcrew, County Meath, Ireland in 1629. His family came of Norman Irish stock, that is, of those Norman families who, over the years, had accepted Irish customs and speech. He had many relatives such as Lord Dunsany and the Earls of Roscommon, Fingall and Louth. Oliver’s paternal uncle, Patrick Plunkett the Abbot of St. Mary’s in Dublin, directed his education to his 16th year. In 1645, under the care of Pierfrancesco Scarampo the papal envoy to The Irish Confederation who was in conflict with the Commonwealth forces of Cromwell at the time, the young Plunkett left Ireland for Rome to study for the priesthood. Many of Plunkett’s relatives were actively involved with the Confederate forces. Plunkett’s studies, in which he was described as brilliant, began in 1647 in the Irish College in Rome and he was ordained in 1654 and appointed the representative in Rome of the Irish bishops. His studies continued and in 1657 he became a professor of theology. During his years of study the position of the Roman Catholic Church in Ireland worsened. The Confederate Armies were defeated by the Cromwellians who then proceeded to punish and penalize the Catholics of Ireland. Guerrilla war, murder, plague and starvation decimated the population. The Church and its institutions were banned and almost completely destroyed. The clergy were hunted down like animals. When the Monarchy was restored under Charles ll there was a relaxation of the anti-popery laws. 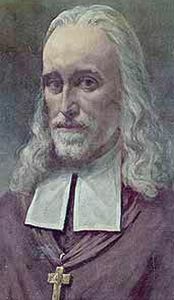 Rome appointed Oliver Plunkett as Archbishop of Armagh and Primate of Ireland and he went to London to try to bring about a relaxation of the penal laws. He returned to Ireland 1670 to his seat in Armagh and proceeded to found schools for children and also for the retraining of priests. He founded a Jesuit College in Drogheda and tackled the problem of drunkenness amongst priests. Within 3 months of his return he administered the Sacrament of Confirmation to 10,000 of the faithful and by 1673 he was able to inform Rome that in all he had confirmed no fewer than 48,655 people. He was reported to have walked the length and breadth of the country to reach his flock. In Drogheda his college, under the care of the Jesuits, blossomed with 150 boys attending it. This number included at least 40 sons of Protestant gentry. He also mediated between the Government and the bands of Toraidhe (guerrilla confederate troops) who had hid in the forests and mountains of Ulster. He had obtained pardons for them and a license to leave the country for the continent. With the introduction of the Test Act 1673, persecution was renewed against those who refused to receive Holy Communion after the Anglican fashion. Oliver Plunkett refused and immediately became a hunted man with a price on his head. His college in Drogheda was destroyed and his schools scattered. He remained free but hunted for the next six years then in 1679 he was seized. He was put on trial and a host of informers perjured themselves. The authorities found that no jury in Ireland would find him guilty so he was then removed to Newgate prison in London. At his first trial there the Grand Jury found no charge against them but he was again put on trial at the behest of Lord Shaftesbury a noted anti-Catholic. He then sentenced Oliver Plunkett to be executed at Tyburn by hanging, drawing and quartering. Oliver responded with “Deo Gratias” in a loud and vigorous voice. This trial was considered to bring the English Bar into disgrace. On 1st July 1681 was removed to Tyburn for execution. Vast crowds bore witness to his serene acceptance of death and admired him for his bravery. Before the act of execution he publicly forgave his tormentors during an edifying discourse. Oliver Plunkett was the last of the Catholic Martyrs at Tyburn. The very next day Lord Shaftesbury, as instigator of the persecution was consigned to the Tower and Titus Oakes thrown into gaol. Oliver’s remains were gathered and put into 2 tin boxes which were then removed to St Giles Anglican church and interred besides the graves of five Jesuits who had been martyred earlier. In 1684 the remains were transferred to the Benedictine monastery at Lambspring in Germany were they rested for 200 years before transferral to St Gregory’s College Downside England. In 1722, Oliver’s head was found to be in a state of excellent preservation and was placed into the care of Dominican nuns in their Siena Convent in Drogheda. He was the first Irish martyr to be beatified in 1920 and then in 1975 he was canonised. Saint Oliver Plunkett is still honoured by many people in Ireland with his Feast Day on 1st July.